Marigrace Becker, MSW, is the Program Manager of Community Education and Impact at the UW Memory and Brain Wellness Center (MBWC). She develops and facilitates education, support, and engagement programs that promote living well with dementia. She also produces resources like the MBWC's patient and family handbook, Living with Memory Loss. She works closely with community partners to spearhead local initiatives that challenge stigma and build understanding. 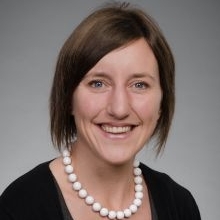 She is a member of the Momentia Seattle Stewardship Team, and leads the Dementia-Friendly Communities project team for the Dementia Action Collaborative implementing the Washington State Plan to Address Alzheimer’s and Other Dementias.